One month. That’s all it’s been since those with early game access on Day 1 started playing. It’s not a long time by any standards, but as shown with the two large patches already announced or implemented, Bioware aren’t backward in coming forward with updates. And finally, the full 1.1 update notes for you – there’s lots of stuff in here we’ll be dissecting in this weekend’s podcast and in follow-up posts, but we’d love to hear your comments on what’s catching your eye with this update. The cooldown indicator on hotbars no longer causes all ability icons to appear grayed out (unusable). Now, when an ability is on cooldown, it will not be grayed out if its activation conditions (like resource costs or range) are met. Using character rotation keys no longer breaks a character out of cover. Enure: This ability’s cooldown has been reduced to 1.5 minutes. Force Push: Now finishes the cooldown on Force Leap. Force Stasis: This ability is now correctly an instant ability when both Stasis Mastery and the 2-piece PvP set bonus are present. Plasma Brand: This ability’s tooltip now properly reflects the damage it does. Its damage has not been adjusted. Endure Pain: This ability’s cooldown has been reduced to 1.5 minutes. Force Push: Now finishes the cooldown on Force Charge. Force Choke: This ability is now correctly an instant ability when both Force Grip and the 2-piece PvP set bonus are present. Flash Grenade now has a 60-second cooldown. Accomplished Sawbones: The tooltip now reflects the actual healing bonus of 10/20/30%. Underdog: The tooltip for this skill has been re-worded to clearly state which abilities are modified. Rough and Tumble: This skill now properly reduces the cooldown of Wounding Shots. Ashara’s Force Blast ability has had its damage increased. Ashara now animates correctly when using dual wield attacks. Fixed a bug that could block marriage dialogue options with this companion. Companion abilities that have been disabled by the player no longer toggle back on when the companion is re-summoned. Corrected an issue that caused the indicator that a companion wants to talk to you to disappear. Companions no longer need to be re-summoned after selling trash items if the player mounts a vehicle after dispatching them. Traveling from a Contested Area to a Contested Region now causes companions to be unsummoned correctly. 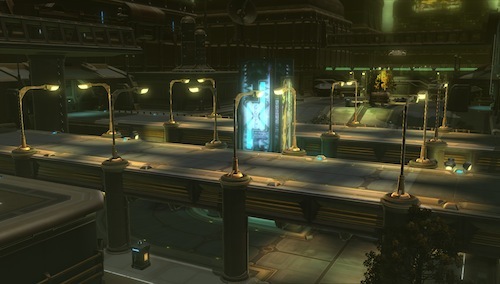 Below, you’ll notice some changes to high-end Biochem and Cybertech crafted items that reduce their output. We understand that these changes may cause concern for Biochemists and Cybertechs, but we’ve made them in order to prevent a situation where any specific crafting skill becomes the objective “best choice” for players challenging endgame content or PvP. We only make this type of change after very careful consideration, and only to ensure a level and fun playing field for all players. All mod type item modification schematics have been removed from the Artifice trainer. These schematics were invalid, and could not be used if purchased. All Energized, Exotech, and Rakata adrenals and stims now require 400 Biochem for use. The Exotech Medpac is now named “Exotech Med Unit.” Its overall healing has been reduced and is now in line with similar level medpacs, and it temporarily increases the maximum health of its targets. Use of this item now requires 400 Biochem. The amount healed by Rakata Medpacs has been reduced. This item now additionally increases maximum health briefly. Use of this item now requires 400 Biochem. Wynz-Tek grenades now require 400 Cybertech for use. Wynz-Tek Grenades have had their damage reduced to bring them more in line with grenades of similar level. The Wynz-Tek Firestorm grenade’s damage has been reduced to bring it in line with grenades of similar level. It now deals damage every 3 seconds over 12 seconds. X-37 Oppressor Droid’s grapple can no longer be resisted, ensuring the fight mechanic behaves as intended. This Flashpoint’s mission now correctly leads the players into the Flashpoint. The Red Reaper mission now updates correctly for the entire group when the mission is obtained on the Imperial or Republic Fleets. Lord Kherus was granting more XP than intended. It has been reduced. Bulwark was dealing more damage than intended in Normal Mode. His damage output has been reduced. Corrected an issue that caused Interrogator to sometimes spawn far more cyborgs than intended. The fight is now more manageable. Corrected an issue that allowed Replicator to become susceptible to crowd control in Hard Mode, making the encounter easier than intended. Tregg no longer immediately initiates his whirlwind attack after leaping to a player target. Players now have more time to react and avoid whirlwind damage. Corrected an issue that caused Jindo Krey to randomly target players with his blaster attack. He now focuses those attacks on his primary target, making him “tankable” as intended. Players can now acquire special Pulse Grenades outside of Darth Malgus’ throne room. These grenades aid groups lacking knockback abilities in defeating him. The Ancient Pylons now reset correctly if not solved within the allotted time. Soa’s mind traps unintentionally had 200k health in Nightmare Mode. This amount has been reduced significantly. The duration of the Penalty of Destiny effect in the Infernal Council encounter has been increased to 1 minute. Players are unable to assist other players in their fight for the duration of this effect. Reduced the damage of Bonethrasher’s Overhead Smash attack and reduced the distance players are knocked back by his Backhand attack in Hard Mode. This gives players more room to avoid being knocked into the pit. 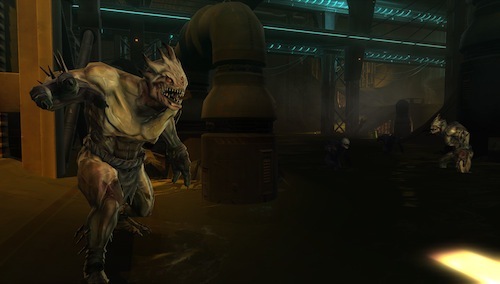 Bonethrasher no longer attacks players immediately after they fall into his pit when re-entering after being defeated, allowing players to regroup before engaging. Several tanking relics that had the incorrect stats have been corrected. The PvP item “Heal Consumable” is now named “Warzone Medpac.” Its cooldown has been reduced from 5 minutes to 3 minutes and it now shares the 1.5-minute cooldown with other medpacs. This item can be used effectively over time, but now cannot be stacked beyond what is intended. The PvP item “Overcharge Consumable” is now named “Warzone Expertise Adrenal.” Its cooldown has been reduced from 5 minutes to 3 minutes and it now shares a cooldown with other adrenals. It (and other adrenals) no longer stack with the PvP Power-Up that increases Expertise to prevent Expertise values from increasing beyond intended levels. Warzone Medpacs and Warzone Expertise Adrenals no longer share a cooldown with each other. A new line of high-end PvP relics with appropriate PvP stats have been added to PvP vendors. Removing a modification from an item and then re-inserting it no longer causes that modification to be lost upon area transitions. Battlemaster Bags now correctly contain Battlemaster Commendations. A Dangerous Auction: The step “Travel to Hutta” now updates if the player travels there via the Imperial Fleet. 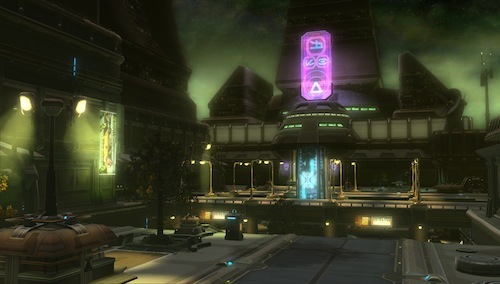 Death Marks: This mission now advances in the Star Cluster Casino regardless of player decisions regarding Yjal on Balmorra. Hutt Hospitality: The conversation with Ambassador Rove now takes into account the outcome of a decision regarding Grub. 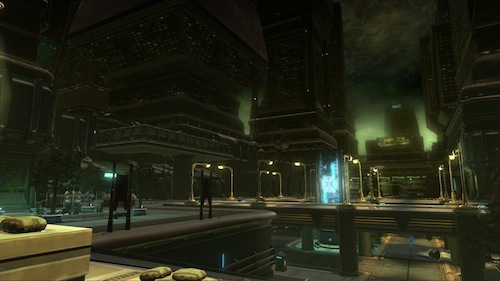 The Mandalorian Killer: Kellian Jarro and Thendys Noori now correctly spawn during this mission. The Sacred Flame: Blank dialogue options no longer display during this mission’s conversations. Back Alley: Players now receive credit for defending the point with the turret. Lab Work: Choosing the dark side option in this mission no longer causes this mission to stop advancing. Prison Breaking: Rist Slayers, Stalkers, Torturers, and Prison Guards now respawn correctly. 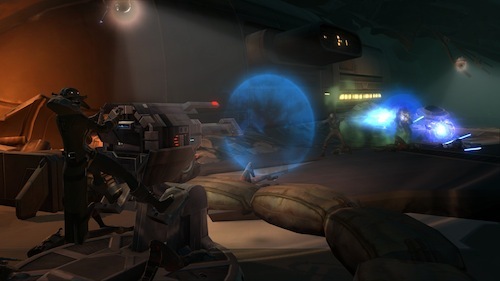 Rescue Operation: This mission now progresses normally if the player is defeated on the step “Use Your Personal Holocom” when fleeing the base. Scorched Earth: The mission objective NPC in this mission no longer spawns as friendly and unattackable in some instances. Shattering: Mission progression no longer becomes blocked if the player returns to the med center after being defeated in combat. Thwarting House Thul: Thul Mercenaries, Thul Sharpshooters, and Thul Colonels now respawn properly. Fixed a bug that could cause specific NPCs to appear miniature-sized in conversations. Players using the French and German clients can now obtain daily PvE missions. Automated defense turrets have been added to Empire and Republic taxi spawn points. Particle Cannons around the Empire and Republic bases now activate more reliably. Chests containing Mercenary Commendations are now available again in the Outlaw’s Den. Armor Upgrade 2 now has the correct armor value. Players now receive the appropriate message when they are unable to enter an area because they are in an Operation group. Opening the Inventory Panel with the button on the Menu Bar now always correctly displays the reverse engineering button. Inviting a new player to a guild no longer causes the member list to display incorrectly. Corrected an issue with older ATI cards that could cause the game to render as a black screen. Falls on the Republic and Imperial Fleets that should lead to death now properly do so. Players who die on the Fleets now respawn at the appropriate med center. Corrected an issue that could cause the game to crash during area transitions. Fixed a bug that could cause players to fall through the world during or after a conversation or cinematic. Over to you: will this update make next Tuesday’s maintenance downtime a little more bearable? If you’re at end content does it seem a little more fleshed out for you now?